An important part of what has made Chow a stand out applicant for so many scholarships has been his achievements as an undergraduate researcher on topics ranging from low cost water filtration to EV batteries. The common thread has been passion for how engineering can help address pressing environmental problems. “I grew up in Hong Kong, a city with significant pollution problems, and living there,” Chow emphasize, “helped shape my interest in studying environmental engineering.” Over the past four years, he has spent significant time advancing research within the Gadgil Lab for Water and Energy Research at UC Berkeley and the Nanoelectrofuel Team at the Energy Systems Division at the Argonne National Laboratory in Illinois. His current project within the Gadgil Lab is developing an automated system for bench-scale testing that allows researchers to run a large number of experiments to assess long-term electrode behavior without requiring constant oversight. 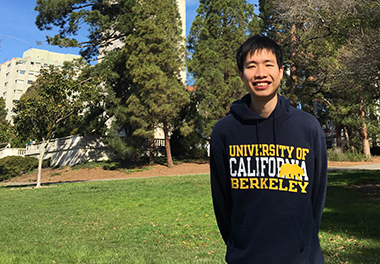 For those Cal students who are just beginning to discover research interests, Chow emphasizes, “It is okay not to know exactly what you like to do in the future. That’s why you’re in college. Try to explore around to find what you like and what you don’t like. Try out different research projects, different student groups, classes across different departments and disciplines. Doing things in order to put them in your resume isn’t the best way to go. Try to find something you’re passionate about and dive into it.” The strategy has clearly served Chun Man Chow well.